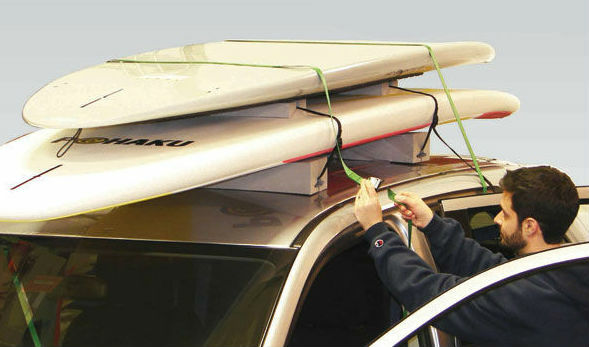 Before you can load your paddleboard to your roof rack for your next SUP adventure, you have secure your SUP roof rack to your car. Because of the different types of roof racks, each will be attached differently, but it's important to install properly. For rack pads, velcro them on your roof rack bars tightly. For straps, clamp them down tightly and check them for any worn or weak spots. For more specialty paddleboard racks, follow the instructions and make sure they fit properly with your car. After you’ve installed the rack, do a quick post-inspection so you really know that everything is snug and secure. You don’t want to lose a paddleboard because you were in a rush and forgot to attach a part of your rack. For cars with roof rack bars, the standard setup is roof rack pads that fasten to your bars and act as a cushion between the bars and your paddleboard, and a strap system to secure your paddleboard to the rack pads. The pads fit around the roof rack bars and secure with (usually) velcro. Secure the two pads, one on the front rack bar and one on the back rack bar, and make sure that they’re straight so when you set your paddleboard on them it won’t be rubbing up against the roof rack bars at all. For cars without roof rack bars, the focus in using the one piece rack system is on securing it to your car. Set the pads out in the general area on your roof where they need to end up, 1 towards the front and 1 towards the back. Straps will be protruding each side of the pads – run the straps underneath your car’s roof so that they meet in the middle, than clamp the front 2 straps together and the back 2 straps together. You’re free to clamp the straps as tightly as possibly because they secure against your metal car (different when strapping down your paddleboard). Double check that your paddleboard is resting fully on the pads and is straight (parallel with your car). If you have a small car, you may have a problem! Paddleboards come in different sizes, but they’re all pretty big, and if you have a small car the straps on your roof rack setup may not be wide enough apart to adequately secure your paddleboard. For example, if you’re trying to strap a rack to a car without roof rack bars, it secures underneath the roof via the inside of the car. Generally, the front strap runs through the open space created by the front door and the back strap runs through the open space created by the back door. If you have a coupe, you only have a front door! So both your front and back straps will have to be secured via that space. The distance then between your front and back roof rack pads and straps will not be that great, and if you strap in your paddleboard the straps may only be 3 or so feet apart. On a 12 foot paddleboard, that leaves almost 5 feet in the front and back of the board without any support. A potential solution is to take a page from the transport of other large equipment, like canoes and kayaks, and to get additional tie downs straps that secure the front and back of the paddleboard to the bumper and trunk of your car. The point is, it is tough to transport big paddleboards on small cars without roof rack bars. Keep this in mind when planning your next SUP adventure.